A quartet of drugs that could prevent migraine headaches, not just treat the symptoms, are competing to get to market. Amgen (NASDAQ: AMGN) of Thousand Oaks, CA, announced Wednesday that its candidate, dubbed erenumab, met the main goal of a 667-patient mid-stage study. If a larger Phase 3 test that should wrap up soon also hits its marks, Amgen might be able to ask the FDA to review the drug for approval. Amgen only outlined the Phase 2 data, however, and ISI Evercore analyst Mark Schoenebaum cautioned in a research note Wednesday that the firm would need to fill in details before a clearer picture of the trial emerged. Erenumab blocks calcitonin gene-related peptide (CGRP), which is released by neurons and is thought to boost the transmission of pain. Several antibody-based drugs work in the same way, and taken on a regular basis, they might help people ward off migraines before they happen. Migraine sufferers can take generic triptan pills, but they only help reduce the pain after symptoms begin. Triptans also only last for a few hours, which can lead to rebound headaches, and can cause high blood pressure and other side effects. In a 2012 national survey by the Centers for Disease Control and Prevention, 14 percent of U.S. adults reported having a migraine or severe headache in the previous three months. 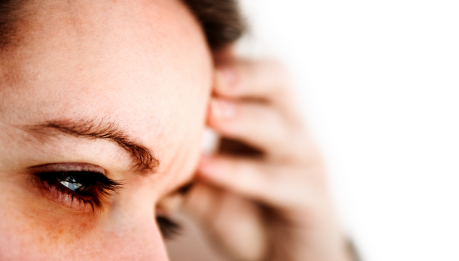 Women reported migraines at more than twice the rate of men, 19 percent compared to 9 percent. The Phase 2 erenumab trial examined the drug’s effect on the direst cases, people who suffered from chronic migraines, about 18 days per month. They were randomly assigned to receive either a low (70 mg) or high (140 mg) dose of erenumab, or a placebo, then tracked for 12 weeks. Those getting the drug at either dose saw their days with migraine reduced by 6.6 days per month, Amgen said. Those on placebo saw a 4.2-day reduction. The difference is statistically significant, Amgen said. Safety issues—primarily pain at the injection site, nausea, and respiratory infection—were similar between those on drug and on placebo, according to Amgen. Schoenebaum wrote that the erenumab data were “roughly comparable” to chronic migraine data from two of Amgen’s competitors, Seattle’s Alder Biopharmaceuticals (NASDAQ: ALDR) and Teva Pharmaceutical Industries (NYSE: TEVA) of Israel. Still, Schoenebaum cautioned that not only was the primary endpoint data from the Phase 2 erenumab study incomplete, but Amgen did not release or outline any of the secondary endpoint data, like erenumab’s impact on the number of hours per month patients have headaches. Plus, cross-trial comparisons always carry caveats. In March, Alder released data from a 600-person Phase 2 chronic migraine study for its drug ALD403. Alder hopes to show ALD403 can be dosed every three months. The dosing frequency, and whether a drug can be self-administered as opposed to given at the hospital, will help differentiate between the candidates that Amgen, Alder, Teva, and Eli Lilly (NYSE: LLY) are developing. Teva got its drug when it bought San Mateo, CA-based Labrys Biologics. Eli Lilly, of Indianapolis, obtained its prospect through a deal with Cambridge, MA-based Arteaus Therapeutics. All four drugs are CGRP antibodies.